DayStar's Imaging Focal Reducer can give you more field of view in your images. 2" to T mount, with T extension tube for even more reduction. With a T-mount camera connected directly to the reducer, the focal length is cut in half - 0.5X. Add the 20mm extension tube for 0.33X. Even better is to combine the T-thread Interference Eliminator (sold separately) with the reducer for an interference-free 0.38X effect. 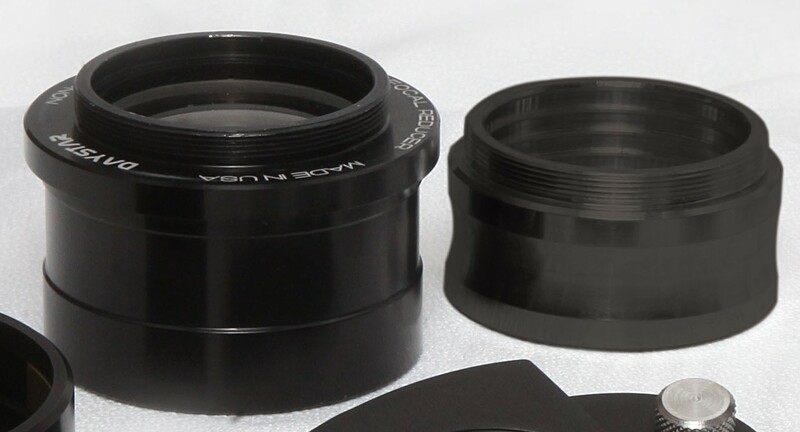 Please note that the obtainable field of view is usually limited by the etalon clear aperture; Quantum filters will result in a larger usable field than Quark or Ion. Allows full disk imaging with SR127 and 2/3" monochrome CCDs such as ICX625, ICX655, IMX250, IMX264. Four elements in two groups. Front: Male 2" eyepiece drawtube. Flange to flange distance: 5mm. Knife edge baffles for superior contrast.